It’s easier to trick the brain into creating an audible illusion of an environment than it is to trick the brain into seeing a believable image. This is why the virtual reality industry has put a stronger focus on developing impressive visuals over realistic audio in the past. However, the introduction of binaural, and more importantly spatial sound has added game-changing levels of realism and significantly improved production quality to VR. Most people understand mono and stereo output and the effect it has on music and sounds when listening through headphones. Binaural sound is a step up from stereo in that it accounts for the shape of the human ear, distance between the ears and the sound source and echo fabrics of each emitting sound around the individual.When recorded, or programmed, correctly the listener is able to establish the direction of the sound source and the likely distance and movement of the source as they listen. It also allows the user to create a concept of the area around them – an open landscape, a small room, a hall etc. Binaural sound works effectively at simulating an environment, however the flaw is that binaural recordings have a set position. The user can perceive the movement of the sound source in relation to their set position but those sound sources are not reactive to the way the user moves their head. An effective way of understanding how binaural audio works is by comparing it to VR video. When a pair of stereo VR videos are put side by side we can effectively simulate a 3D view of a digital environment from a fixed perspective (e.g roller coaster simulations). We can see that the environment in view looks realistic and has depth, however if we try to adjust our line of sight and rotate our heads we know that we won’t be able to see the full environment because the videos do not contain the full amount of data required to allow the environment to react to the way our heads are moving. This is the same for binaural audio. It gives us the illusion of sounds within a 3D space, but without enough information to tell us what the sounds would sound like from any other ear locations apart from the fixed one programmed to the experience. Spatial sound works in a similar way to binaural sound, but incorporates the added element of the user’s head movement into the calculations. This way, we can create experiences in which the sounds dynamically react to the users movements within the environment in the same way that they would work in real life. Spatial sound allows us to simulate all the main audio cues humans use to locate sound and incorporate them into a virtual experience. These cues are time difference (the time the sound takes to travel from the source to our ears and the slight difference in time to travel to the nearest and furthest away ear), spectral filtering (using our outer ear to recognise sound coming from different directions) and level differences (using the volume of a sound to determine it’s proximity to our location). We have developed a new software solution to allow our immersive experiences to sound as good as they look. We incorporate our enhanced environment sound formulas into all of our immersive experiences and build multi-source emitting objects and planes before sending a compiled signal to each ear. This, in conjunction with high standard CGI visuals, anti motion sickness movement chairs, our software controlled scent unit and gesture controls create a superior immersive VR experience to anything else currently available. If you would like to enquire about hiring our EEVR chairs please contact our hires department on 01767 317614. 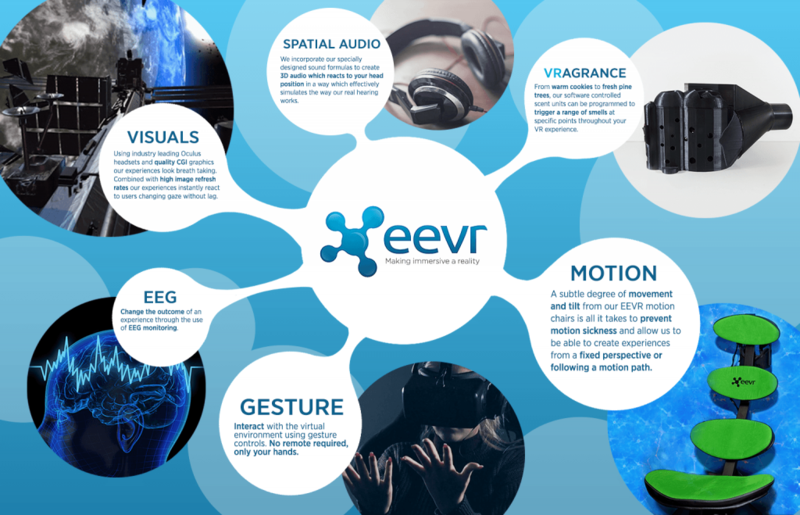 Want to find out more about EEVR? Read our post on avoiding motion sickness here.